I believe these concepts are known, respectively, as a “car” and a “helicopter.” Will the Vehicle To Transport Individuals fly? It’s not exactly clear. So what are we talking about here? A flying helicopter? 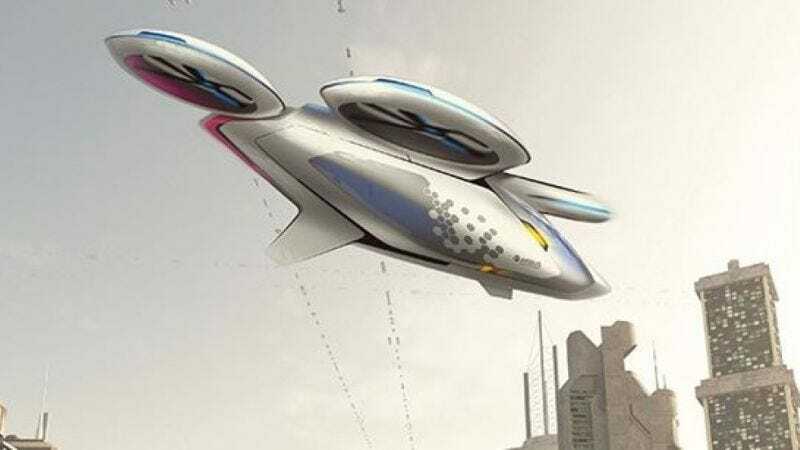 OK.
“One hundred years ago, urban transport went underground, now we have the technological wherewithal to go above ground,” Airbus CEO Tom Enders told the DLD digital tech conference in Munich, adding he hoped the Airbus could fly a demonstration vehicle for single-person transport by the end of the year. “We are in an experimentation phase, we take this development very seriously,” he said, adding that Airbus recognized such technologies would have to be clean to avoid further polluting congested cities. It’s unclear if Airbus plans to make its prototype similar to the one it sketched out last fall, but the point is it’s still not feasible. We’ve been talking about flying cars for nearly 100 years, and what needs to be tackled to actually use one in public... well, it’s a stretch. If it’s reliable, that’s important, but the Federal Aviation Administration also has to approve it. So: a stretch. Enders also pitched the idea as being a weird form of austerity. If we can fly, he says, why take care of the roads? “With flying, you don’t need to pour billions into concrete bridges and roads,” he reportedly said, indifferent to the fact the auto industry is simultaneously on a quest to bring autonomous vehicles to the market as soon as possible, while also neglecting the fact that human-driven cars will be on the road for some time to come. Meaning: We’ll still need roads. There’s more. Reuters says the objective for Airbus is to allow people to book a vehicle using an app, because Mobility requires an app. Anyway, flying cars (c. 1921). Cool.